Circle the date, July 8th. The day Universal Studio’s Diagon Alley is open to the public! I’m so excited but I’m also kicking myself that I didn’t postpone our February trip for July. Imagine being able to ride the Hogwarts Express, shop at Scribbulus or Magical Menagerie (just in case you need an owl or a hippogriff). And food? You can eat British food at the Leaky Cauldron, and devour Butterbeer ice cream at Florean Fortescue’s ice cream parlour. Since it’s going to be a while before I get a chance to go, I’m making Butterbeer at home, based on the 1400’s version. If you haven’t tried the ‘authentic’ Butterbeer before, try my recipe. Start by making a version of Butterbeer. In a saucepan, pour in 140 ml of the British Ale, and set aside the other beer in a container for later use. Add in the butter, pumpkin pie spice and brown sugar into the saucepan. Stir until dissolved, then let simmer on a low heat until slightly reduced. Meanwhile in a mixer, add in the egg yolks and beat until pale, then add in the sugar, then the cream. Once the Butterbeer is reduced, pour in with the rest of the beer in the container. In the saucepan, still over a low heat, add in the cream, egg and sugar mixture. Stir and continue stirring so the egg doesn’t cook. Once it begins to thicken, turn off the heat. If you find the custard is starting to curl, take it off the heat, pour into the mixer and turn onto high. If it still hasn’t thickened, pour it back into the saucepan and continue to cook. Once thickened, push it through a strainer to keep out any gloopy bits, into a bowl (metal or glass I find is best) in an ice bath. Place in the fridge for a few hours to let cool completely. Next follow your ice cream maker instructions until your ice cream is ready! 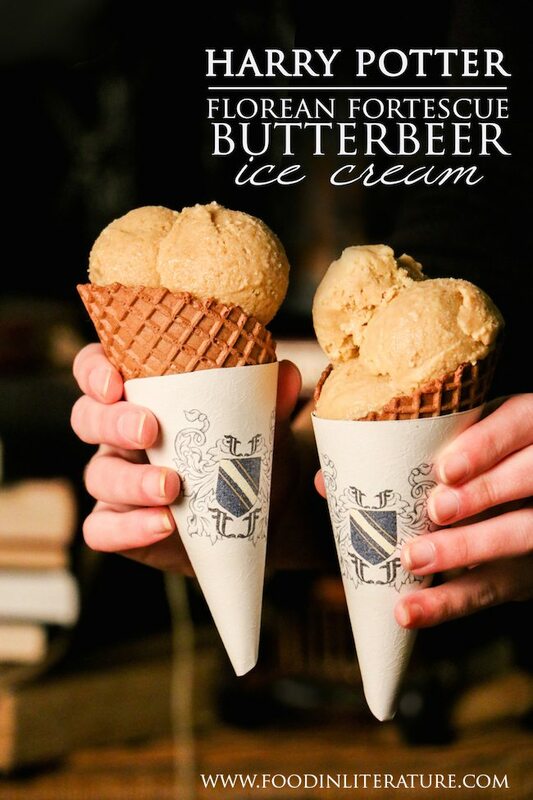 Share your own Butterbeer ice cream creations right here! YUM! I so want to visit Diagon Alley but unfortunately a US trip isn’t on the cards for a while. Might have to make this and dream of it instead. Hey! I was wondering if you would know what to do if I don’t have an ice cream maker! Can I just freeze them in the freezer? Hi Elainn, Yes you can just freeze it, but it will be harder. I’d recommended taking it out from time to time as it freezes and putting it in your mixer. The main reason is so the air gets into the ice cream and makes it’s usually fluffier and therefore easier to scoop. Is British Ale a beer? If so what should I look for as a substitute here in the US? We went to Universal this past November. It was AWESOME! We spent 3 days there and I could have spent all of that time in Diagon Alley and Hogsmede! The theming is amazing! Re the beer most bottle shops will have an international section with a British Ale. There are brands like Old Speckled Hen, Spitfire, London Pride, etc. Publix carries a butterbeer-like soda in 12-ounce bottles mad by the Bubbling (Boiling?) Cauldron. It comes in a 4-pack and tastes JUST like BB. Might be able to substitute that for the ale. We went to Universal/IOA last month due to winning free 1-day, dual park passes. The BB Ice Cream was excellent, the fish-and-chips were great as well. I spent 2 years in the UK back in 1982-1984 while serving in the USAF at RAF Woodbridge. We had a truck park outside the front gate every work day which would fry up FRESH F&C and wrap it in newspaper. A suitable substitute here is Mrs. Paul’s beer battered fish portions or smaller served with seasoned French Fries. Winn-Dixie carries the english malt vinegar. Continued…. The Gringot’s ride was great but I wasn’t as thrilled with Diagon Alley as I was when IOA’s HP land opened. You now have to take everything out of your pockets, put it in a locker (provided) and THEN go through a stupid TSA-like metal detector/wanding before getting on ANY of the rollercoasters (1 @ Universal and 3 at IOA). It’s a PITA! Too many idiots losing their cellphones, change, etc. from their loose pockets. At another park, a Darwin Award winner climbed 2 fences and passed 3 warning signs to retrieve his hat that blew off while he was riding it. The coaster made sure his hat wasn’t needed anymore (like a soccer ball). The whole taking everything out of your pockets sounds like a nightmare! I’m just wondering if you know of a non-alcoholic Butterbeer recipe, or at least one that doesn’t have a main ingredient with hops? That’d be great if you do know of one. Try the butterscotch soda at Publix. On the soda isle, in a 12 ounce, 4 pack of bottles. How about you use root beer for the not alcoholic version. I used root beer in place of the beer. It tasted great! Question: Do you pour the entire bottle of ale into the mix? Or just the portion you simmered on the stove? What size bottle for the ale? 350 ml? Also, what specific recommendation do you have on ale type or brands? I can’t wait to make this! What is thickened cream? Heavy whipping cream? Also, I saw that you haven’t been to Diagon Alley yet. It is AMAZING! I went last October and I learned that they have 3 specialty (alcoholic) beers that you can get only in the Wizarding World of Harry Potter. Two are in Diagon Alley, and one is at Hog’s Head in Hogsmeade (you haven’t been at all, you need admit to both parks). They are Hog’s Head Brew (my favorite), Dragon Scale (not for me), and Wizard’s Brew (a stout – so good). For those of us not in the US what might ”pumpkin pie spice’ be? and what proportions of basic spices would one use to make some? Thank you so much for the recipe! This is much closer to what I imagined butterbeer to be. Other recipes seem to have too much sugary sweetness, and no beer flavor. This is delicious! My spousal unit also thinks so. I used a bottle of Newcastle Brown Ale, as the suggested beer is not available in my area. Newcastle is a pretty strong British ale which seems to have kept its flavor profile even against all the cream and milk. I used half the recommended cream and the other half whole milk to cut the fat a bit and it worked fine. I plan to try it again with a coffee stout or maybe a pumpkin ale closer to fall. Newcastle seems to be readily available throughout the US for anyone wanting to try the recipe. Glad you liked it 🙂 And thanks for suggesting another British Ale! It’s good to have a variety of brands listed so others know what they can look for. Hi, I was wondering if there was a nonalcoholic substitute for the ale. I’d really prefer not having to use anything alcoholic. I just got back from Florida on Oct. 10, 2015. LOVED every second of Univeral Studios. When you go, and I KNOW you will – just from the love you showed coming up with these recipes – be sure and get a park to park pass. That way you can ride the Hogwarts Express between the parks. And it would be better to get a 2-3 day pass, as trying to do both parks in one day is exhausting (that’s what we did). 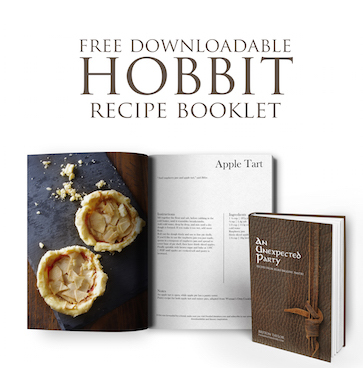 I WILL be trying some of these recipes. Thank you SOOOO much. I also found a butterscotch soda at Cracker Barrel. It tasted fairly good, makes a fair substitute. Can I just say you are AMAZING! Not just this post – although it is awesome – but all of them! You’re creativity amazes me! Really! Not only are you able to live your favorite books, but allow others to live them to. This. Was. AMAZING! I’m afraid all of my children will want this for their birthdays.